This week we made some major visual progress on the van. Not only did Ben get the roof rack up but we also got plywood up on the walls and we installed our flooring! The van is starting to finally look more like a home and less like a crazy idea that’s destined to fail. On Sunday last week, Ben started to install the fan and was cut short due to a sudden storm; he was able to tape some plastic sheeting over the hole but then had to get down quickly. He went back up on Monday and found everything stayed sealed throughout the wind and rain. With the hole already made, he was able to quickly clean it up, put some Rustoleum on the raw metal and get the fan installed; it looks so great up there and we are happy to have that ready to go for when we get electricity running. After finishing the fan and dinner plans with family, Ben spent a little more time wrestling the roof rack while I insulated the bottom half of the back doors with wool. We are getting low on wool, so we are going to need to get creative on how we insulate the rest of the doors and the wheel wells. The struggle of the week with the roof rack is getting the towers with crossbars attached to fit into the mounts in the rails. Ben was able to get the rear most bar attached, but on all the others he was having trouble getting the bar to properly lock into the track mounts. Of course, nothing in the roof rack installation process would be easy! Tuesday was an extra exciting day because it was my birthday! We had a lovely stress-free day going out for an epic breakfast, stopping at a farmers’ market for fresh berries and working at the cutest little coffee shop. In the afternoon we debated between working more, paddle boarding, or working on the van and chose to stay inside and work so that we could spend more time on the van on Wednesday. We finished the day with a wonderful dinner and started planning for Wednesday’s build work. On Wednesday, we were able to get both walls up in one day! Last week, we made templates for all the curved and non-right angled parts of the van (there are many!) and measured out where on the wall they are. We also cut out the wall panels to fit around the rear windows. They will be the upper rear wall pieces, these were the most difficult so it felt good to start the week with them completed. With those two panels ready to go, we were ready to get started attaching them to the strapping (the studs). We tested out our new nail gun on some scrap pieces and then I went to town nailing while Ben held the pieces in place. Once the first two pieces were in, we measured the spaces below and beside them to know how big to cut the rest of the plywood. All the other pieces were easier because we just had to cut outlines and didn’t have any more window holes to try to fit. Each piece was cut and fit into place then nailed in (I did end up adding screws to certain areas that looked like they were holding more pressure or not staying in well enough but I made sure to countersink so they are flush with the wall). I was the official nail gun operator during the wall installation and I’d be lying if I said I didn’t enjoy it. Installing the walls was another big milestone for us on the build. I feel like with everything we have done and will do we start out thinking there’s no way we can do it ourselves. Then we research and figure out how we are going to do it and have a little tiny bit of confidence but still a lot of doubt. Then we start and wonder if we are completely bonkers. But about halfway through we get the hang of it and start gaining confidence. It’s exciting to see everything come together and to know what we can do if we put our minds to it (watching a lot of tutorials on YouTube helps too). We have many more milestones left to go and are looking forward to learning, doing, and enjoying as we progress with the build. Friday was the start of the flooring for us, another area we weren’t really sure about. 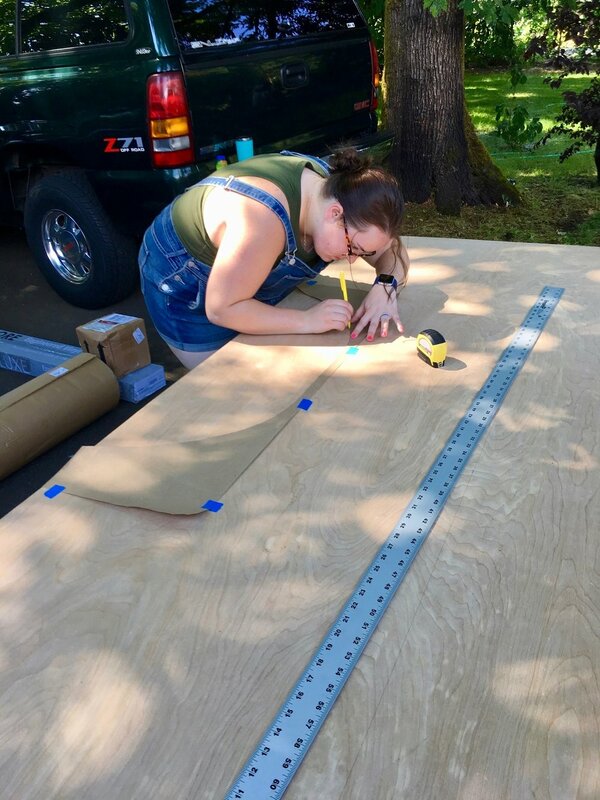 To begin with, we decided that we wanted to box out the wheel wells first so we had straight edges to work with for the flooring (it was hard enough cutting straight lines, I can’t imagine trying to cut curved ones). I measured and cut the 1 x 2 pieces to size and Ben got to try out the Kreg pocket hole jig and drill holes for the screws. After a few wrong turns and miscommunications, we finally got everything assembled and in place. While these were just two box frames, it was a good intro to all the furniture building ahead. While Ben was testing out the Kreg pocket hole jig and working on the wheel wells, I started to cut trim pieces to go around the window. I didn’t get too far however and will be talking about those later on when we get them finished up. Once the boxes around the wheel wells were in place, it was time to lay the cork underlayment. We didn’t need to put down underlayment in the van but I was worried that the sub-floor wasn’t as level as we thought and the underlayment will help to even everything out. We specifically went with cork because it is the most natural option that we could find and it also is an incredible sound barrier. Another plus of adding cork underlayment is that it’s another layer of insulation on the floors! We bought our cork underlayment at Home Depot but we had to order it from the website because they didn’t carry it in any stores around us (they do carry it and the underlayment adhesive on Amazon as well though). Home Depot has a few cork underlayment options but we decided to go with the ⅛” option. I started by cutting the cork into the rough sizes we would need and then began the install process starting at the back of the van. Both the cork underlayment and the subfloor boards are 4 ft wide (except the back plywood piece which is about 3.5 ft) and I didn’t want the cork seams to be at the same place as the plywood seams since that’s where we had the most difference in floor height. Starting at the back ensured that all the seams would be offset, I rolled out my pre-cut sections of cork wide enough to span the width of the van and cut the edges to fit in as exactly as possible. Once I was happy with the fit of the cork, I rolled up half of it, spread the adhesive with a small (1/16”) notched trowel, and unrolled the cork back onto the adhesive and into place. After the first half was in place, I applied glue to the second half and laid it down as well. Ben helped press down edges and smooth everything out while I moved on to the next area. The cork adhesive is EXTREMELY sticky and it’s really hard to move the cork once it’s placed down, so be careful and move slowly. One problem that I ran into was that the cork is very thin and breaks quite easily, so I had to be extra careful when moving around and tried to avoid bending it too much. We purchased our vinyl flooring about two weeks ago from Lumber Liquidators. We knew going in that we needed vinyl because wood and laminate are not great when dealing with water and potentially moist conditions or when you are changing weather conditions frequently such as in a van. So we were looking for vinyl plank flooring and were directed toward the engineered vinyl plank which has a stronger core to it and is supposedly more durable than traditional vinyl or luxury vinyl plank as it’s sometimes called. Vinyl flooring comes in click and lock as well as glue down varieties (peel and stick is also an option). The click and lock is advertised as a super easy to install flooring option for homes since it doesn’t need to be glued down, and can be installed as a “floating” floor. Since most people buying vinyl are installing in homes and the easy option is a huge attraction it seems like most places just sell the click and lock variety. We had been warned to avoid click and lock since it can buckle with changes in temperature, or if water makes it through the waterproof top layer, but our understanding from speaking with the team at Lumber Liquidators and doing some of our own research is that engineered vinyl plank flooring has alleviated some or all of the buckling concerns. However, a van goes through different conditions than a home and with all the day to day bumping and vibrations we were concerned about making sure the floor was secured and therefore were reluctant to go with a floating option. We were assured that the click and lock could be glued down, so went ahead and purchased it despite our misgivings. We didn’t put much thought into how difficult it would be to glue down the click and lock until about a week ago. As we thought through what we would need to do, we renewed our search for a glue down option we liked, but still couldn’t find anything, so decided to give the click and lock a try. Right away we learned that the install process made the cork underlayment process seem like a cake walk and we were quickly missing the ease of laying down simple sheets of cork. It’s a pretty easy concept, in theory, just measure out your pieces to fit, lay the glue, wait about 20 minutes, then lay your flooring. We also knew to stagger the seams to make it look more natural so we cut some pieces shorter to get some offsets going. We got started and our plan seemed to work in the first round, as we were wrapping up though we realized we had made a significant mistake. 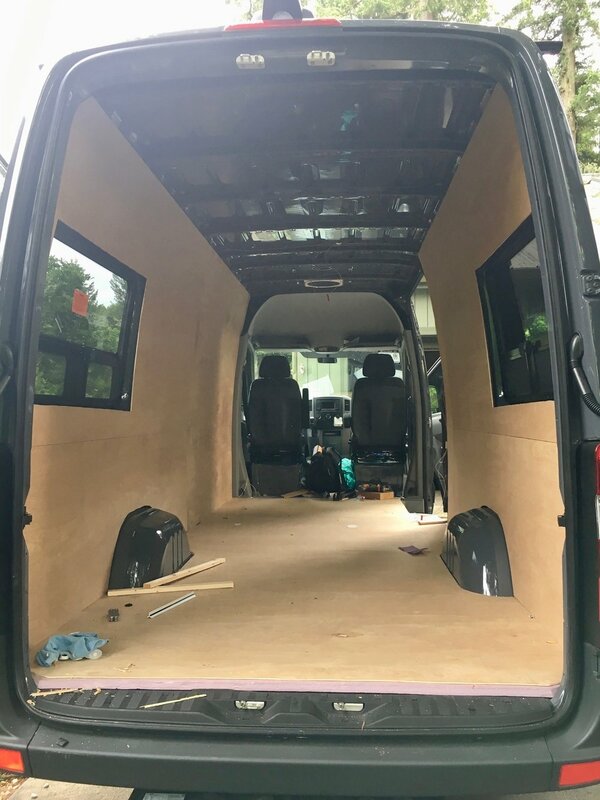 Similar to the cork, we wanted to install the flooring in sections and decided to do quadrants of the van starting with the front driver’s side. We got the floor laid all the way up to the wheel well boxes but then realized we had gotten ourselves into trouble. Due to the staggering of the seams, we had an empty space between two boards where a short piece needed to go to end at the wheel box. What we didn’t think about though was the fact that the click and lock flooring needs to be angled in on one side to click into place, and then laid down to lock. Since it was between two boards, we could click but we couldn’t lock. Since we realized right away, we were able to remove the outside board, get the short piece in and replace the longer board before the glue had a chance to set. The glue has a 45 minute set time, but we had let the glue sit a bit before laying everything down so we were starting to push the window a bit. With that issue resolved, we came to the realization that we need to lay one full-length row (front of van to back) at a time to prevent the same problem from arising again. We also decided to not let the glue sit prior to laying down the flooring which sped up the process and gave us more work time before it set. Once we were clear of the wheel wells we were able to get going pretty quickly. After some more measuring and cutting, we got the rest of the flooring in. Apart from some of the pieces arriving to us a bit banged up, installing the click and lock wouldn’t have been too hard had we not been gluing it down. The glue just added an additional layer of complication and made it more difficult to adjust as we went. Now that it is all in though, we are very glad we glued it down. It is very secure and has a nice feel to it with the cork underneath. Given the choice, we would want to go with straight glue down flooring if we were to do this again but would glue down click and lock again if it meant getting the flooring we wanted. While successful, the flooring did, however, take all day (minus a break to go to the science museum with my little brother) so we didn’t have time to do anything else. My little brother, Pascal, was so cute/annoying all day though. He was really excited about seeing the floors go in and would come out about every 30 minutes to check on us and the progress. He was so overjoyed to get in the van once the floors were in. It was nice having a little cheerleader telling us we were going so fast and doing such a nice job and that the floors looked so good! 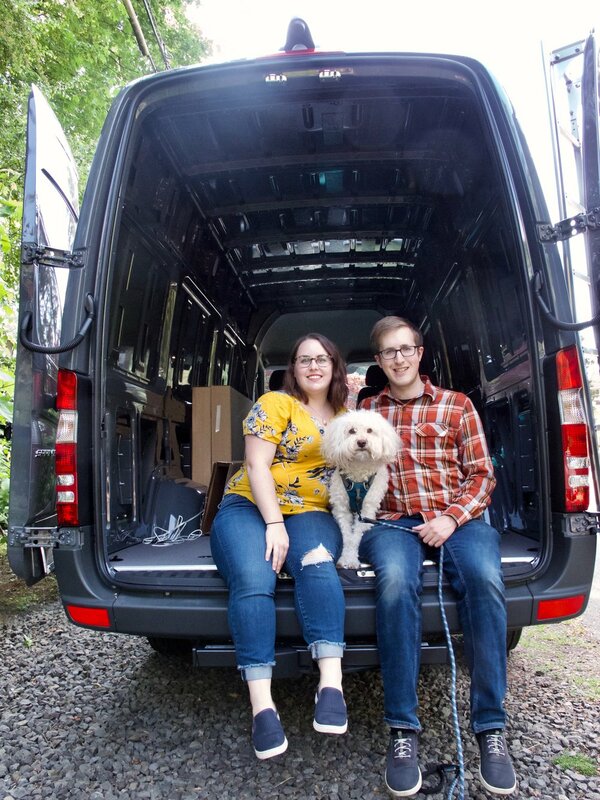 We were on such a high from getting the floors in and having a part of the van finalized (it may have also been from the adhesives we were using)! We rolled into Sunday not really sure what we were going to do; we had only planned the week up through getting the floors in, so Sunday was a pretty laid back day. Ben finished up installing the roof rack, we spent some time at Home Depot getting supplies for the electrical and ceiling, and then I took Pascal to the pool while Ben planned out most of the electrical and ordered a bunch of supplies from Amazon. We know that the electrical install is coming up fast so it is comforting to see some of the details falling into place. It’s been fun having Pascal around but it has definitely modified our build schedule and the amount of time we have to build. Next week we plan to get going with some more big milestones and hopefully complete the ceiling (complete with lights) and maybe paint some walls, but with having Pascal around for another week we don’t know what the week has in store for us. Check in next Thursday to see how much we get done with the little one around.